The average annual salary of a medical assistant is $30,550, which is about an average hourly pay of $14.69. 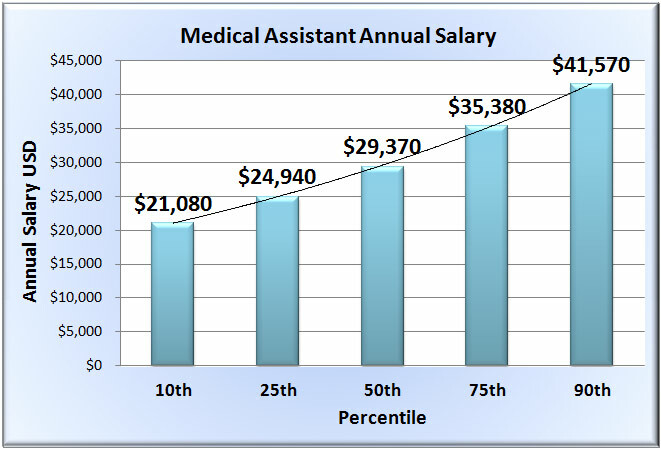 The top 10 percent of medical assistants earn around $41,570, while the bottom 10 percent earn $21,080. Salaries may vary depending on level of qualification, experience, place of occupation and geography. The highest paying medical assistant positions are at psychiatric/substance abuse hospitals, insurance companies, scientific research facilities, and dentist offices. Cities with the highest average salaries for medical assistants include Vallejo, CA ($47,430), Fairbanks, AK ($42,520), San Francisco ($41,900), Santa Rosa, CA ($39,830) and Danbury, CT ($39,430). There were around 560,800 medical assistants employed in the United States in 2012. The majority of medical assistants work in physicians' offices and hospitals or other healthcare facilities. Medical assistants are high in demand. The employment rate is expected to increase by 29 percent from 2012 to 2022, which is a lot faster than the average rate for all occupations.